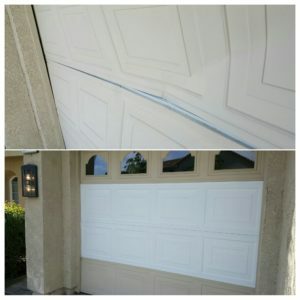 Our customers needed to fix some lingering garage door issues they discovered shortly after purchasing their new home. As they cleaned up the garage, they noticed that their garage door wasn’t straight. Not only that, it also seemed to be tilting away from their house. figure out what was going on. We were able to get out to their home the same day, and discovered that their upper panel had some damage and was in need of replacement. You can see the damage and tilt in the image below. After thinking about how the upper panel may have been damaged in the first place, we finally understood that the garage door opener was the culprit. The previous homeowners had installed the garage door opener themselves. This meant that it was done improperly. There is a reason professional garage door installers exist! The poor installation resulted in the damage to the upper panel of the garage door. What was the issue with the garage door opener installation? 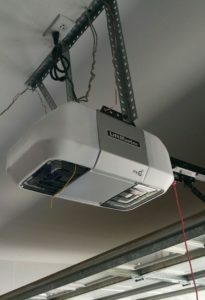 The problem with the installation was that the garage door opener was mounted to the garage itself with a piece of wood. This is NOT the correct way to mount a garage door opener. Always use the correct mounting materials and the right mount meant for your garage door setup. Because the previous homeowners mounted the opener to the wood, it damaged the panel, which is illustrated below. Thankfully for our customers, it was a quick fix! We installed a center mount and installed it, pictures below. We also were able to find a replacement panel for their garage door. This meant the homeowners didn’t have to invest in a brand new door (more expensive) and could just replace a section of the damaged garage door with a new panel. Once the panel was order, we installed a few days later when the part arrived. Once the new panel was installed, we re-balanced the garage door. Additionally we checked that the garage door opener, garage door springs, garage censors and all other hardware was set and installed properly. 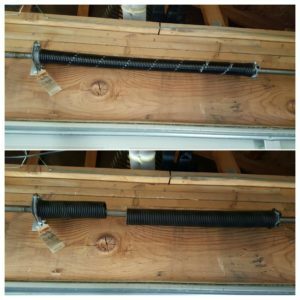 It is very important to use the correct size garage door springs when replacing the springs on your garage door. You also need to make sure you are using the right type of spring. If your springs are too small for your door, then the door will be heavier than it should be for the opener. It can fall or wear out your opener easily. The springs will most likely break or snap more quickly too. The way to figure out the correct sized spring for your door, is to figure out the weight of the door. 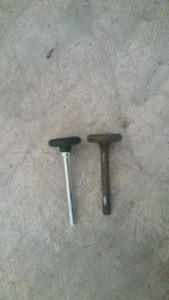 This is done with a common measuring tool garage door techs carry on their trucks. There are 2 options once the weight of the door is determined. Install a single spring system. This is recommended for one car garage doors only or very light 2 car garage doors. Install a double spring system. This is the preferred installation for 2 car garage doors and all heavy garage doors. Shorter Life Span: single springs don’t last as long as double springs. It’s a higher upfront cost, but lower over the life of the spring or springs. Safety: Single spring systems carry a bigger risk of springs snapping while the door is in motion. If this happens, the door can fall quickly down and damage property or worse, a person. Opener Wear and Tear: The door will be heavier, which will wear down the opener more quickly. More money to replace it sooner! Conversely, there are some big advantages to installing a 2 spring system on your 2 car garage door. They last longer! They can last up to twice as long as some single spring systems. If a spring does break or snap while the door is moving, the 2nd spring acts as a backup to support the door so it doesn’t fall. It is VERY rare that both springs would snap at the same time. 2 springs make your door much lighter, so the opener has a much easier time opening and closing it. This will allow your to get more years out of your opener. You can see in the picture above the broken springs and the new ones we installed. You’ll notice they are MUCH bigger than the older springs. These old springs are ONLY 4 years old, and they already snapped! This is what happens when you put in the wrong size. Correctly sizing your garage door springs will ensure accidents don’t happen. If you’re in the Houston area, give Perfect Solutions a call so we can fit the proper size springs for your door and ensure your safety! Many home owners opt to complete garage door repairs themselves. For those who have the time and experience, these types of projects work out well. There are times when individuals have the required knowledge and experience; however, they are short on time. Perfect Solutions Garage Door will be thrilled to complete your project for you as well as help you sift through your many choices of garage door replacement parts. Some garage doors repairs are pretty basic, while others are a bit more complex. There are a couple that are actually very dangerous. Whether danger is involved or not, it is important that a trained tech complete repairs, especially, if they involved the installation of replacement parts. about replacement part deals available on the market now. Springs are in place to balance the extreme amount of weight of the garage door. If the spring snap and the door suddenly drop, it could injure or kill anyone in the way. It could also result in property damage and extensive repair costs as well. Garage door safety cables are another hazardous repair. Cables are there to protect you, your loved ones, and your property. Cable and spring repair or replacement must be done as soon as possible to prevent injury and further damage. There are a number of other basic things that can go wrong. These are not severely dangerous; however, they can be tedious and time consuming. Accidents happen regardless of how hard you try to prevent them. One result of garage accidents is bending your track. A bent track can cause the noise level of operation to increase or possible prevent you from being able to open it at all. In many cases the track can be bent back into shape fairly easily. If you need to replace your track, call Perfect Solutions for the best at the smallest cost. Other basic repairs involve closing limits and safety beams. These can generally be adjusted by the average DIY home owner, but again, this depends on time constraints. Garage door maintenance can also be a simple DIY project. It requires a bit of know-how and time to complete it right. Maintenance is important to extend the function and life of your garage door. This is generally a clean and lube project; however, upon inspection, you might run into more complicated issues or need to replacement parts for the hardware components. We encourage you to call our crew at Perfect Solutions Garage Door today for any of your family’s needs. Remember to call on us in the event that you have a garage door emergency. Our emergency services are available day or night, any time of year. Accidents happen from time to time and in some case damage occurs. It seems that garage doors receive more abuse than any other element of a home. While a garage door is a sound investment, it is nothing to sneeze at. It can be costly especially if you do not know where to find supplies at reasonable prices. One of the most common replacement parts sought are garage door panels. Perfect Solutions Garage Door is here for you when you need assistance locating one or multiple panels. ll as the portion everyone in the neighborhood sees. 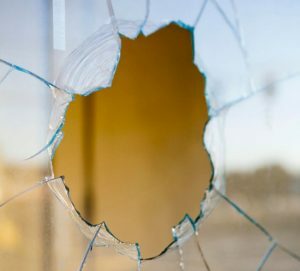 Home owners often become frustrated when one of their panels is damaged because they believe that the entire door must be replaced. It can also be stressful when you call upon a tech who tries to sell you something that you do not actually need. In many cases, a single panel may be replaced. It is greatly dependent upon the extent of the damage that your garage door has suffered. There is generally not a need to purchase and install a whole new door. Our professionals at Perfect Solutions Garage Doors can come out and inspect yours to determine exactly what is in order to get it functioning as well as looking like new again. Our number one priorities are your satisfaction and your family’s safety. Once we inspect your garage door, we will present you with your available options and their respective costs. If it only requires one replacement panel, we will only suggest the one. You never have to worry about our techs trying to sell you something that your family does not need. Our team is 100% professional and completely dedicated to our clients. We will find the highest quality products and the lowest cost to present to you. We never dawdle so your garage door will be up and running again in no time. Our team will complete your project in the timeliest manner possible and clean up our mess before we leave. In the event that all of your panels require replacing, we are highly trained in all garage door areas. We can even install an entirely different door in case you are up for a change. We will also be happy to present you with the many high tech garage door openers available on today’s market and install that as well. Always remember that Perfect Solutions Garage Door is always here for all of your emergencies as well. You can call on us 24 hours a day, 7 days a week, and even on holidays for emergency repairs. We understand how busy family life can be. We are all family here and can turn your life right side up again. Give our team a call for simple or complex jobs. Contact us to help find your garage door replacement panels as well as install them. We are also available to perform routine maintenance on your door to keep in it shape for years to come. One issue that home owners sometimes deal is the garage door randomly opens for no reason at all. This is not a common problem; however, it is not entirely impossible either. While this can be rather frustrating, it can also be dangerous for a number of reasons. The garage door is a shield or first defense for families and their valuables. It could be disastrous, if your garage door decides to open for no apparent reason. Criminals will have easy access to your property. Worse than that, if it opens while family is resting in bed, criminals will have access to your family. There are a number of reasons why your garage door suddenly opens on its own. Older garage door openers can be activated by the neighbor’s automatic opener. Today garage door openers are equipped with a feature referred to as a rolling code. Each time you raise or lower your garage door the remote generates a new code to prevent thieves from entering your home. Those which are 20 years old or older were not designed with a large assortment of codes. It is therefore more likely that the neighbor’s remote is the culprit of your garage door’s strange behavior. There are a number of possible causes and knowing which the culprit is may help identify an appropriate solution. For example, in 1993 garage door opener companies redesigned their products with safety features. One of these is a sensor mechanism and it was added to prevent accidental garage door injury. The sensor eye may need to be cleaned or the beam may be misaligned. Interestingly enough, older garage door openers from Stanley were engineered with flawed circuit boards. This defect common caused doors to spontaneously open. It is best to contact your local garage door expert to have a modern opener installed. Power surges from wiring defects may cause this odd behavior as well. Lightning storms are another cause of power surges and odd garage door behavior. Another cause can be items that the opener is stored with, especially plain old traditional junk. In some cases, the garage door opener can be triggered by the frequency that neighboring military equipment uses. Note: In the event that there is an issue with the wiring, you should contact a professional to inspect the system to resolve it. This includes the garage door system as well as the power source it is plugged into. It is uncommon for anything to accidently activate your garage door opener. This does not mean that it is entirely impossible. There are numerous common devices which can trigger it due to the frequency those devices employ. Below is a list of several; however, it is not all of the possibilities. It does lend insight into the type of devices which do utilize frequencies and therefore may trigger the opener. It may not be possible to figure out exactly why your garage door operates itself. In most cases, home owners opt to replace the garage door auto-opener system completely, especially if, the system is outdated. Call us at Perfect Solutions Garage Door Repair to schedule your opener installation project today.